Diamond Star Of The East Hotel Zanzibarl, Diamonds Dream of Zanzibar Hotel, Diamonds Le Gemma Dell'est Hotel, The Star Of The East Beach Resort Zanzibar, North Coast Beach Resorts, Zanzibar North Coast Hotels, Diamonds Star Of The East Beach Resort Zanzibar :-A guide to accommodation in Zanzibar inclusive of Hotels in Zanzibar Stone Town, East coast Beach hotels, South coast Beach Resorts, North East Coast Hotels and activities diving and snorkeling, dhow and dolphin safaris, wind surfing, deep sea fishing. with its own plunge pool and a tastefully furnished terrace, a covered Makuti patio. The villas are named after eleven of the most precious gems in the world to match the modern and contemporary African style architecture. Personal butler service, a private beach and unmatched all-inclusive services accommodate the most discerning traveller with the ultimate in comfort, privacy and luxury. Literally everything and anything you could dream of is catered for at the very highest level of all-inclusive services including access to all facilities, restaurants and bars of Diamonds La Gemma Dell�Est. The Diamonds Star the East Beach Hotel and Resort has a total of 11 villas. The villas are either one or two bedrooms. 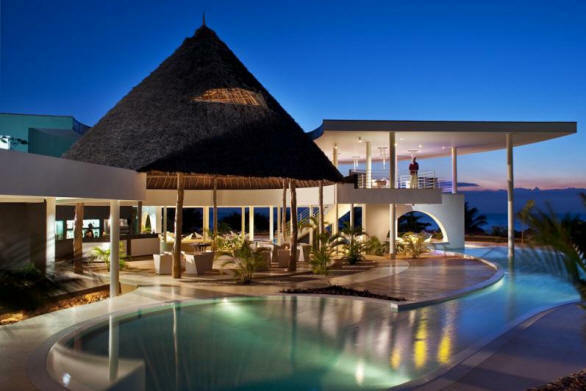 The Diamonds Star Of The East Hotel has a total of 11 Villas- 9 one bedroom villas and 2 two bedroom villas with additional in-room Jacuzzi designed in modern contemporary and African style and built to give the discerning guests the ultimate on space and luxurious privacy. Facilities in the room include, King size bed, choice of cushions and duvet, individually controlled air-conditioning, flat screen TV with satellite international channels, entertainment console, Laptop and business desk pad with exclusive stationary, Wi- Fi internet access, in-room large safe box, Private bar, specialty coffee and tea making facilities, walk-in closet, spacious bathroom with indoor and outdoor walk-in shower, 2 hand basins, face mirror, hair dryer, private WC, didet, indoor Jacuzzi as per reservation, exclusive choice of amenities, electric current 220 volts AC 50 cycles. MAXIMUM NO OF GUEST PER ROOM-1 BEDROOM VILLA 3; 2 BEDROOM VILLA 6. MINIMUM STAY DURING XMAS AND NEW YEAR 5 NIGHTS. RATES ARE ALL INCLUSIVE OF MEALS, ACCOMMODATION, DRINKS DURING MEALS, HEALTH SPA, GAMES AND SPORTS, VALET SERVICES AND MANY MORE. PLEASE ASK FOR CLARIFICATION DURING YOUR BOOKING. Capturing the beauty and magic of African d�cor, Mvua African Rain Spa blends earthy colors and dramatic images to evoke a sensory journey and invites guest to built a personal experience in its calming space. At Mvua African Rain Spa we utilize indigenous moisture � nourishing natural ingredients and other native resources such as plants, flowers, salt, grains, spices, wild honey and raw sugar. Our tempting choices of treatments are based on ancient African, Asian and European traditions designed to soothe the spirit, rejuvenate the body and enrich the mind. After experiencing the attentive service and warm ambience, you will not want your visit to Mvua African Rain Spa end and you will return again and again. Perfect for refreshing the mind, body and soul, these ritual spa treatments are sure to complement your stay with us. Ranging from 80 minutes up to 260 minutes. These indulgent scrub & ritual treatments are designed to increase circulation, add nutrition, detoxify and decongest the body�s tissues. Using natural botanical selected products from Zanzibar and around the world. Even the most fabulous of hair needs extra care on a regular basis. With our sumptuous treatments, it�ll only take a little pampering time to give you some really enormous result. Average temperature is 23 - 33 during the entire year. Occasional rain is during May and June. Ocean Blue Restaurant fine dining international a la carte dishes with open view of stunning gardens and ocean. * Breakfast 7:00 am � 10:30 am; *Lunch 1:00 pm � 3:00 pm; * Dinner 7:30 pm � 10:30 pm. Inclusive access to all Diamonds La Gemma dell�Est facilities and Food & Beverage Outlets at no extra charge. The Tiara Lounge bar opens from 09:00 am till 11:30 pm serves refreshing finger food, snacks and a variety of International and Local drinks and large selection of cocktails. Inclusive access to all Diamonds La Gemma dell�Est facilities and Food & Beverage Outlets at no extra charge.